There is extensive coverage in the Daily Mail today, including on the front page, to kick off the Great British Spring Clean (GBSC) 2019, with Environment Minister Thérèse Coffey among the 461,000 litter heroes heading out today to start cleaning up the UK. 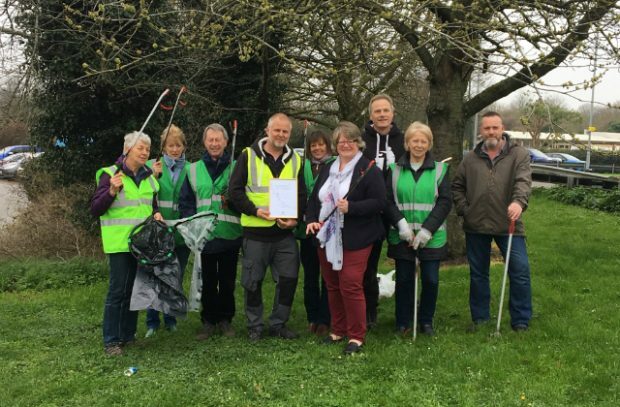 The campaign is being run by Keep Britain Tidy in Partnership with the Daily Mail, and has been backed by the Prime Minister, Environment Secretary Michael Gove and Minister Thérèse Coffey, and Wilkos. This morning, Environment Minister Thérèse Coffey attended a litter pick in Suffolk, covered live on BBC Radio Suffolk. Whilst there, she presented a Prime Minister’s Points of Light (PoL) award to volunteer Jason Alexander for his outstanding contribution to tackling litter. Jason set up the initiative 'Rubbish Walks’ to highlight the impact that plastic and cigarette butts are having on coastal environments. I am delighted to present Jason with the Prime Minister’s Points of Light award for outstanding contributions to tackle litter and kick off the Great British Spring Clean 2019. I’d like to congratulate Keep Britain Tidy and the Daily Mail on their campaign to help tackle the scourge of litter in our environment. We all need to be united to make littering an unacceptable habit of the past. The annual event calls on communities to clean up their local area through local litter picking events. Last year, over 370,000 #LitterHeroes collected litter at 13,500 events across the UK. This year over 450,000 people have already registered to take part. This year’s event focuses on collecting and disposing of single-use plastic from our streets, parks and beaches, recycling as much as possible. The Great British Spring Clean officially runs from 22 March – 23 April 2019. You can sign-up to local litter picking events through the Keep Britain Tidy website.